The National Congressional Club (NCC), originally the Congressional Club of North Carolina and later renamed the Conservative Club, was a political action committee formed by Tom Ellis in 1973 to help retire the campaign debts of U.S. senator Jesse Helms. The club rapidly became a formidable fund-raising and media organization closely identified with Helms and his conservative agenda. It also was noteworthy for what critics called "attack ads"-television ads that emphasized presumably negative aspects of an opponent's record. Under Ellis's leadership and with Carter Wrenn as executive director, the NCC successfully managed a number of campaigns for the U.S. Senate, including Helms's runs in 1978, 1984, and 1990, as well as John East's campaign in 1980 and Lauch Faircloth's in 1992. It is also credited with Ronald Reagan's victory in the 1976 North Carolina GOP primary against incumbent President Gerald Ford and raised an estimated $10 million during Reagan's successful 1980 campaign for the presidency. In the mid-1980s Fairness in Media, a committee of NCC members and allies of Helms, initiated a very public fight to take over the Columbia Broadcasting System in order to promote their political goals. The takeover bid failed but gained a great deal of publicity for Helms and the Congressional Club. In 1993 the NCC supported the first successful twentieth century Republican candidate for mayor of Raleigh, Tom Fetzer, a former staffer for the organization. It was not as successful in other races, notably those for Congress and the governorship. The NCC had a falling out with Helms in 1993 and had to lay off some staff members and relocate its offices from Raleigh to Franklin County. In 1996, calling itself the Conservative Club, it was revitalized and gave a brief boost to the presidential aspirations of millionaire businessman Steve Forbes, a proponent of the flat tax. Forbes won a few early GOP primaries and did some early damage to front-runner Bob Dole of Kansas, but the legendary attack ads of the Congressional Club did not have national staying power, and even Forbes started to take a more positive tone before his campaign collapsed. Rob Christensen, "Forbes' Fabulous Rise Is Conservative Club's Comeback," Raleigh News and Observer, 29 Jan. 1996. Michael Crowley, "Under a Rock," New Republic (29 Jan. 1996). Ernest B. Furgurson, Hard Right: The Rise of Jesse Helms (1986). 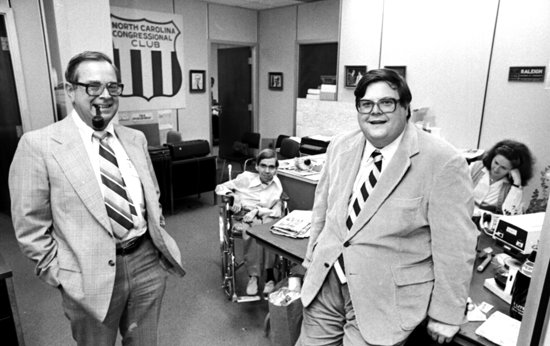 William D. Snider, Helms and Hunt: The North Carolina Senate Race, 1984 (1985). John F. Stacks, "The Machine That Jesse Built," Time (14 Sept. 1981). Hill, Jackson. Tom Ellis (left) and Carter Wren (right) at the National Congressional Club office, November 12, 1979. Copyright News & Observer, all rights reserved. Used with permission. Housed at the N.C. State Archives, call no. NO_18426Fr25.